Wrap shirts, originally uploaded by fmirela. Wrap-around blouses are a must in the summer. An uncomplicated wrapped blouse with no fastening – just tie it place! The wrapped blouse is fashionably cropped and creates a lovely, feminine shape. I had this eyelet embroidered and paisley printed fabric in my stash for quite some time. I knew it was going to be a shirt of some sort for the office, something casual. Thank you Alina for the inspiration with this pattern. I have managed to reduce my stack of fabrics by three and fill the hangers! With the fresh knowledge about the pattern, I’m was sewing mine faster then ever. I’ve cut it in less then an hour, then quickly pinned the seams as I already knew their order. I like pinning my pieces while they are still fresh cut and lying flat on the table. Another half an hour was reserved for sewing all the front, back, under sleeve and shoulders seams. All I had to do is set in the collar, sleeves and sew the hems. I love fast projects with happy endings! 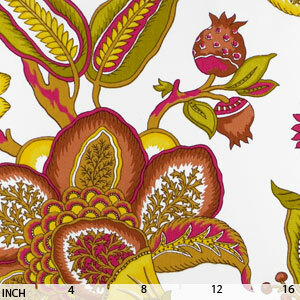 I just had to buy the same print in blue and will probably transform it into a dress. Every time I visit the JoAnn store I can’t help myself with getting just a little bit of fabric. This time it was this colorful cotton for a shirt. A little Christmas-sy so I added an off white ribbon, instead of the red satin like for the presents. Wrap Shirts Burda WOF 06/2006, originally uploaded by fmirela. My friend Alina is sewing. She chose an ambitious first project and we’ve sewn it together this weekend. The pattern: 110 from Burda WOF 06/2006. We started by choosing the fabric. JoAnn had a nice collection of cotton eyelets. The only thing about them I do not like is the width, the very narrow width… The shirts front was overlapped, so we needed to get even more fabric then anticipated. I have been sewing for a long time now, I wish I know more about details on cuffs, collars, hems, and other details. There always room for me to learn, I just sew things how I feel it is better at the moment, and of course, that is not always the best approach. A good read and reference is the Vogue Sewing Book. Since it is good to learn from others mistakes, I’ll share a few mistakes I’ve made with this project. For starters I did not have a tailors chalk and this fabric was a little sheer. We decided to place only a few marks in crayon on the seam allowances and cut at an even distance from the seam lines. Not such a good idea when this is the first fabric you cut. Of course we were faced with some challenges like the bias band around the collar line, the split sleeve cuffs. I think this happens with any project. There is that little seam where you pin your pieces down tens of times before the fabric meets the machine. I think that the translated Romanian instructions in the magazine were not that clear on some parts. I tend not to follow then anyway, I have realized I do not sew by the books, but as it feels right at the moment. Sometimes the moment is not that right, and I end up struggling to figure out what goes where. After so many years of sewing I still have a lot to learn myself and I’m a little frustrated not to teach the wrong techniques. I think everything would have been easier with the seam lines marked in place. Pressing every seam helps in some cases. In our case, I think it stretched the fabric where it was bias cut. Using the overlocker gives professional finished seam allowances, but it can also make like harder, if you are stitching over the collar and have to take sharp turns. 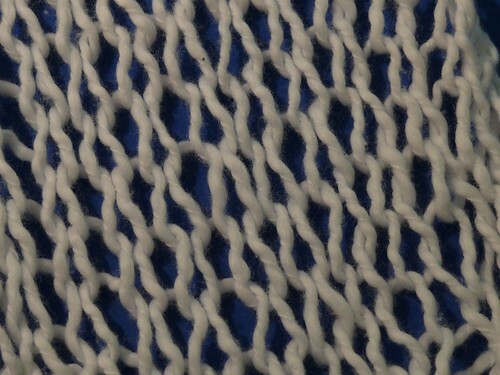 This should be done only after stitching with the machine. For us this resulted in a very uneven, non symmetrical collar that needed to be adjusted. Pinching the seam allowances in the wrong places can also give a headache. We have done this close to the cuff, on the sleeve’s underarm seam. Shouldn’t have! Stiff fabrics with absolutely no stretch are hard to fold. This embroidered eyelet did not let us hem the waist band by folding twice and topstitching, no matter how many Vs we have cut to fold it. Finally we have folded the whole thing in two, sewed it together right sides facing and turned it inside out. We had to lengthen the shirt by at least 8cm at the hem line. Pay attention that the sleeves are not full length, just a little more the ¾. The V neck line in front is very very deep. For a large bust the pattern must be adjusted for enough room. Even with all these challenges the end result drove Alina towards more sewing. She fell in love with another fabric that is not cut into pieces, full of pins and waiting for her to put it back together with a brand new sewing machine! In fact I liked the pattern and the look so much! Now I am making my own version(s). Sewing it over the course of the weekend was fun. The boys handled the barbecue, while us girls were sewing! It was a good plan to beat this summer heat! She promissed photos of the blouse soon so keep looking! Galaxy Crochet Circles Top, originally uploaded by fmirela. I have promissed photos of this top, so here they are! I love crochet and started working on something more serious. The wrapped red jacket from Burda WOF 05/2007. Thank you Tany for all your help and inspiration! Also many thanks to Amie Hirtes and her nextitch precious videos. They are a treasure to watch! Bit stitches, originally uploaded by fmirela. After my experience with the last piece of work on the Bond, a little leftover white cotton was perfect for the stitch I wanted to try. 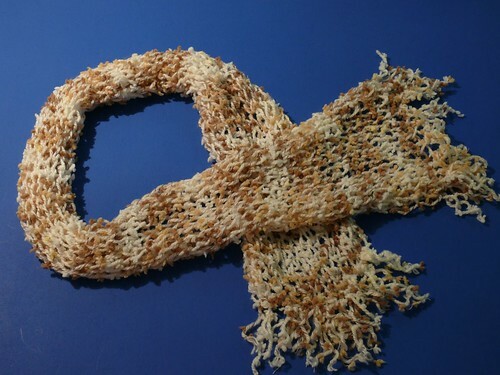 The one Sue suggested for creating a really long scarf in no time! This could be an evening project, or something you can create as a present when you forgot to go shopping for one. I finished it in HALF an hour! She says: knit only a third of the length you want it to be when it is done. Then drop every second stitch and add the fringe on the edges!It works! You will create the largest stitches and your work will stretch and widen. 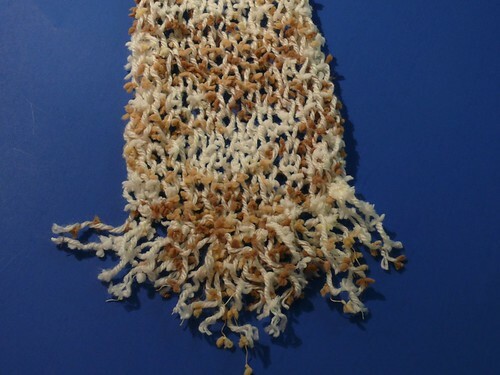 This technique could be good for scarves, shawls, light blankets, loose net coverups and the list goes on. Here is the leftover yarn knitted into a white scarf as a present for my mom and the fluffy fringed beige for my mother in law. For the beige I found 50cents worth for a ball. 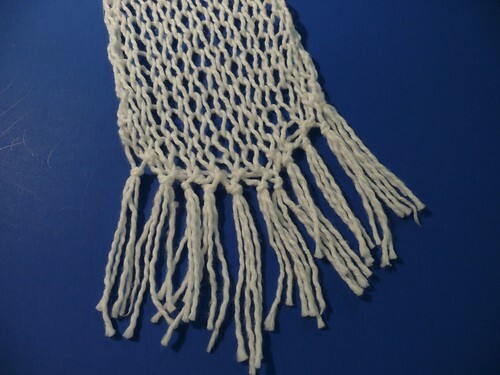 Knit it, unravel it, then add some fringe! Sweater, originally uploaded by fmirela. It took me forever to finish my white pullover on the Bond. All the right-side stitches needed to be hand caught with the latch tool. To do this every 3 stitches for the front, back and the sleeves, took at least four times more longer then the simple knit. Blocking the pieces made me realize right away I had a bug. I have made a mistake in transforming the pattern to suit my yarn. I checked all the calculations and they were fine. I guess I just did not count right and missed knitting the rows that were marked as increment or decrease. The top ended up too short and quite tight. I kind of like how it turned out, since it is ribbed it fits close to my body. The shoulder seams are in place and the length of the sleeves is fine. I did had to come up with a quick solution to lengthen the sweater a little bit. Low waist jeans, cold office space and a short sweater do not mix well. 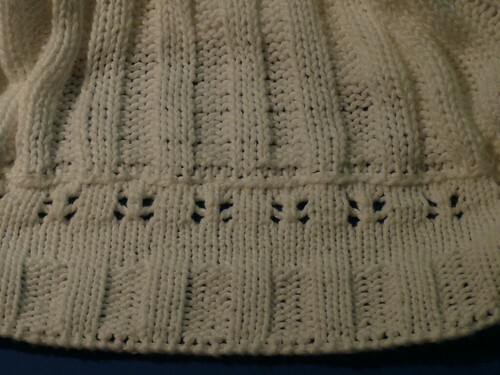 I’ve read that it is harder to lengthen it on the lower edge where the knit started. Some suggested to cut out the casting, knit a separate band and then seam the two pieces back. I thought: “No way was I to cut anything! Not after so much work!”, so what should I do? Hmm maybe crocheting a nice border would do the trick? 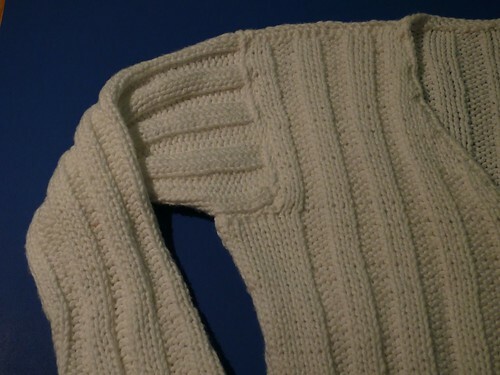 Maybe, but I have not gone in this direction wither, I just did not think it would match the ribbing. I hang my work again on the Bond upside down, with the back of the work facing me. I decided to knit upside down and do a few lace like motifs. I did a few more simple rows and ended with the ribbing to match the initial pattern. I used a smaller gauge on the machine to make the edge tighter. Now it looks like the border was done on purpose and I can finally wear it! I do still like the look of Burda’s sweater and wish mine turned out more like that…It is surely very different from the pattern I had in mind and this makes it unique. Crochet flowers, originally uploaded by fmirela. I found a nice weekend project on Crochet Me Magazine, the Galaxy Top by Katy Westcott. This is what you could be doing in a weekend with bad rainy weather, or an extremely hot summer day like it is now in Florida. All you need is a cotton yarn and some leftover fabric or an old T Shirt to revamp. 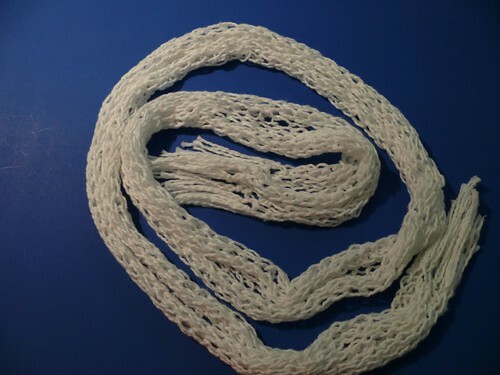 To be honest, sugar and cream yarn is kind of a pour choice to work with for crochet, it is pretty rough on your hands. It was the perfect color choice for my fabric, so i went for it anyway. 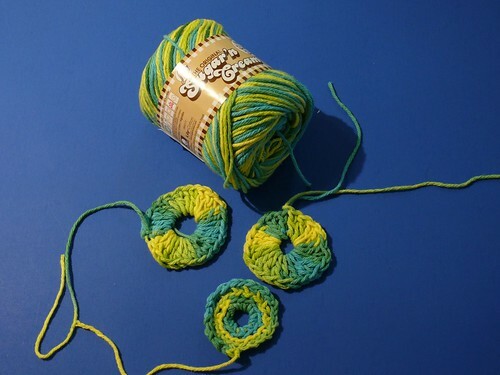 As for the fabric, I had a little green jersey leftover form the Green T.
I crochet only the adjustable circles (after reading this tutorial on The Magical Adjustable Ring by Donna Hulka) and then zig zagged a chain stitch in between for the top’s neckline.